Your Miranda mod appears to cause MEHEM to error into a Critical Mission Failure. See the attached video and description for explanation. I can't say for sure that the minimum mods you'll need are just MEHEM and your mod so I disclosed in the video which mods I have enabled. If you need a savegame for the ending let me know and I'll upload some towards the end so you can duplicate. I'll report this on MEHEM as well so you can hash out what broke it. Thanks Mate for letting us know, although this is a very simple mod where only the textures were replaced in those particular .pcc files. Also Miranda does not even appear on the Normandy in that ending scene thus the games would not need to use any of those .pcc files what do not even correspond to; and as I've noticed the 'mission failure' happens before the convo selection input, thus the game does not need to load anything else yet. Why do you think the fault is of this mod's? Thnx. Process of elimination. I put that information in the video description. I disabled all the mods until I narrowed downed the ones duplicating the problem. I then tested each mod individually. When you play MEHEM ending only, nothing happens. When you play with this mod only (with MEHEM disabled) nothing happens. When you play them in conjunction, you get this error. I also attached Save games in the video description. You can test all this for yourselves to see if you can duplicate the problem. 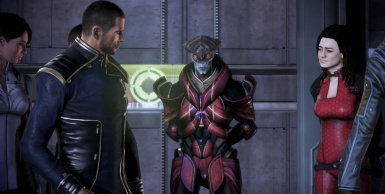 Also there is an option in the MEHEM installer to include the JP love interest ending with Jack or Miranda appearing on the Normandy memorial scene. I'm not sure if that has in bearing as to why this occurred but I wouldn't exclude it either. You may want to check with the other "ending" mods to see if they error out as well. Hello Croc, unfortunately I've never played Skyrim and so do not know what UUNP version is, plus right now busy with mesh editing for Miranda in shorts mod... Perhaps I could help you to make one yourself... How about that? Have a good one. R.